A couple of weeks ago I visited the Hillwood Estate in DC. The first time I visited was during last year's Seersucker Social, but I was too sick to walk around and enjoy the estate. This time my aim was to see the Pret a Papier exhibit of the work of Isabelle de Borchgrave. Isn't that a beautiful dress? Is it made of silk, cotton? Is the lace Belgian? Well, the lace is Belgian because the artist is, but it's made entirely of paper. Amazing. I didn't know what to expect with the dresses. Once you know they're paper you can tell (mostly), but without that knowledge I would be a little stumped, I think. The lace was one of the best details, in my opinion. She uses very very fine transparent paper and the carefully paints the lace design and scallops with scissors. Close up you can tell it's created with paint, but from a few feet away the likeness is pretty astounding. 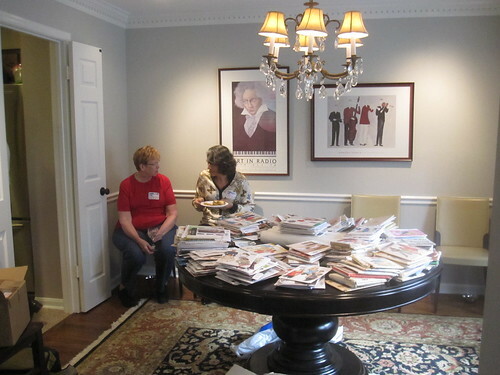 The Hillwood commissioned several pieces for the exhibition based on portraits in their collection. They displayed the dresses with the paintings by which they were inspired (here is another one, though I think this piece had already been created based on another of the artist's works). The artist creates her own prints, including plaids and florals. 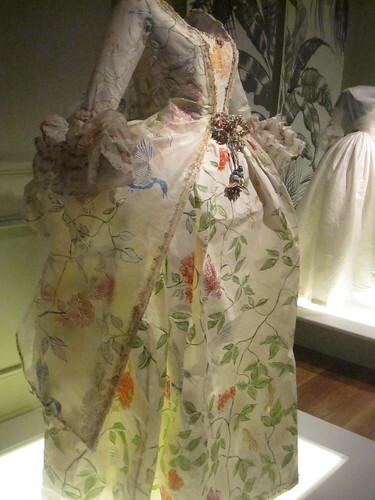 I loved the delicate print to this French court-style gown. 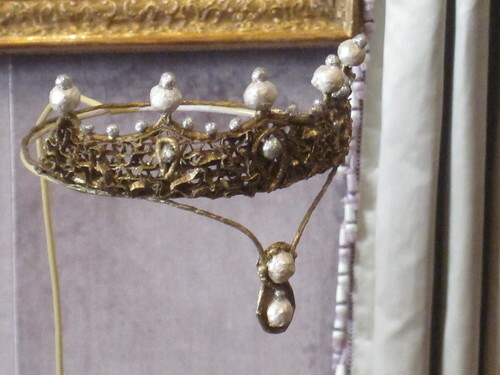 And don't miss a close-up of that waist adornment. Everything is made of paper, including the jewels and other non-fabric decorative elements. 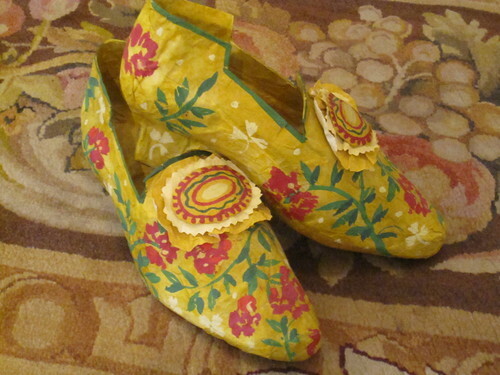 The artist even created shoes to go with some of the items! Unfortunately, this whole post is sort of a tease. I went to the exhibit on the next to last day. It closed on January 21. 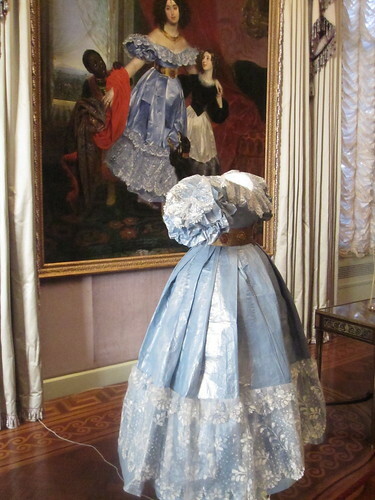 However, there are still plenty of reasons to visit the Hillwood for fashion inspiration! 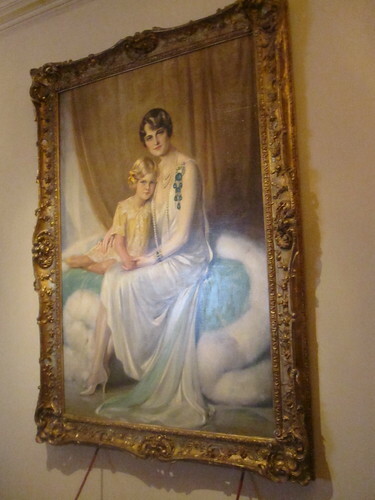 There are many portraits throughout the estate, some from past centuries and some more recent. I loved the flapper vibe to this one. 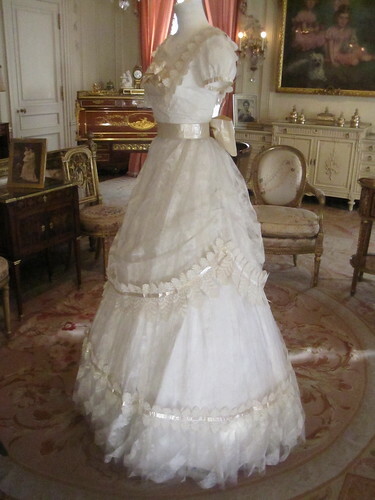 In addition, there are display cases with jewelry and knick knacks in various rooms of the estate. 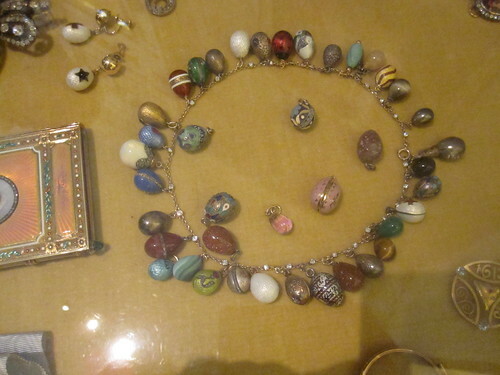 I was really charmed (heh, punny) by this egg charm necklace. And if you notice the emerald brooch in the photo above--the real thing is displayed in the bedroom closet and it is jaw-dropping. The grounds are not to be missed. 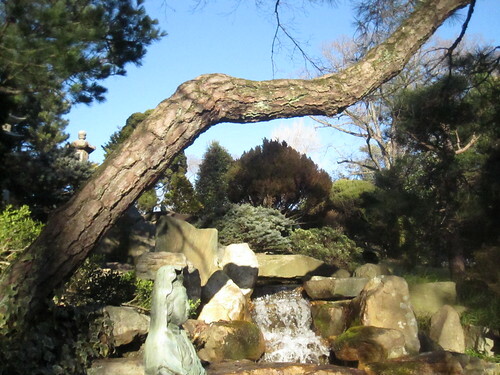 The Japanese garden is beautiful even during the winter. 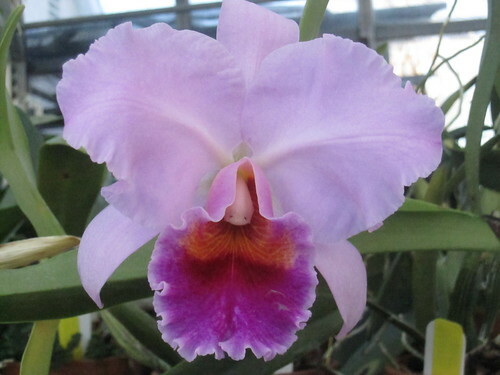 And if it's too cold to enjoy the grounds (January 20 turned out to be a ridiculously nice day--I walked around with only a sweater), there is always the greenhouse to get your orchid fix. Though I am spoiled by DC's copious free museums (the Hillwood is $15 per adult), it is definitely worth a visit! There are several more dresses and details to look at here. 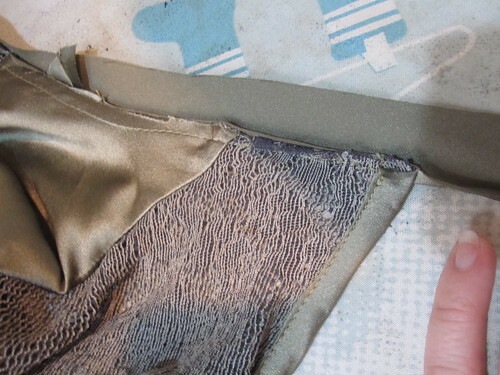 You may recall that when we went to Fabric Mart, this somewhat scratchy nylon jacquard was the only piece I regretted. I had bought it thinking sheath dress (honestly, I'm not sure why I thought an ivory sheath dress would be a good idea in the first place. I blame the fabric haze). Anyway, I realized when I got it home that it was in no way suitable for a dress. I thought it might make a nice jacket, but the ivory color wasn't turning me on as a jacket. Then I got the idea to dye it, as nylon takes dye to some extent. So then I thought I'd dye it orange and make it into a jacket for me. I usually sew for my mom for Christmas (I occasionally even take pictures, but then never get around to posting the projects). The only two people I'll sew for are my mom and my niece, because they both like whatever I make for them. I don't take requests! Purple is her favorite color, so I decided to dye the fabric purple and make a jacket for her. In snoop shopping I ran across this casual Eileen Fisher Open Front Three Quarter Sleeve Coat ($468). I really like the causal open look and thought the longer length would suit my mom. 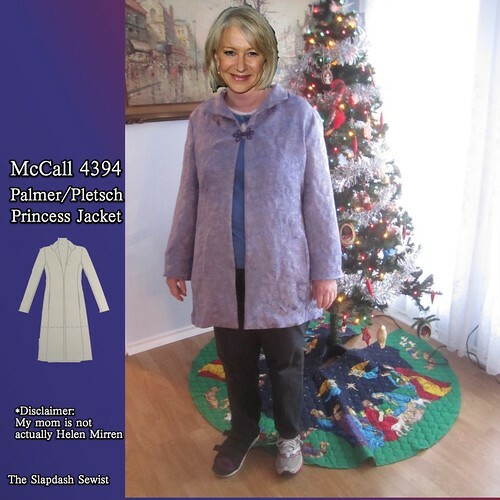 I had McCall 4394, a Palmer/Pletsch wardrobe, in my stash. This pattern is now long out of print, but it has nice classic elements. I may give the princess top a try at some point. 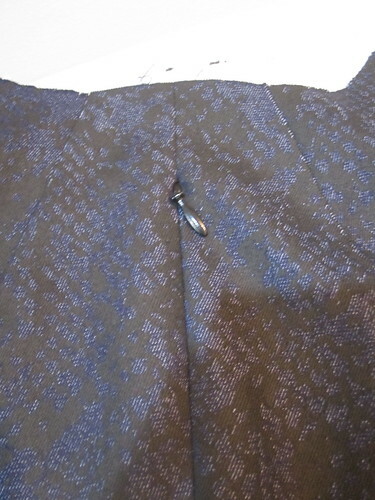 I also appreciate the fitting/alteration lines printed on the pattern. That is a big advantage of the Palmer/Pletsch line. I did a full bicep adjustment, in addition to a swayback, as mentioned below. One of the things I really like about the draft is that it has nice shaping through the back. Too often, center back seams are straight, when nobody is straight in the back! I also did a small swayback adjustment. It's hard to get my mom to give me a set of current measurements, and I don't know all the adjustments she needs. But I figured I was safe with a swayback adjustment. My one gripe about this pattern is that the pocket placement is very low. I mean, I'm short, but I don't know that I'm *that* short. To be able to put my hands in the pocket I had to be pulling up the coat a bit. Check the placement before you make it. The pattern is drafted with a two-piece sleeve that naturally curves toward the front, to follow the anatomical shape of the arm. It's a nice detail. The jacket isn't designed with a closure. I thought I had made it with an overlap so I could put buttons on, but due to the lack of measurements that was not the case. We bought a frog closure from Joann in white. I figured I'd dip it into dye and hopefully it would take a little color. Well, it turns out those frogs are extremely dyeable! 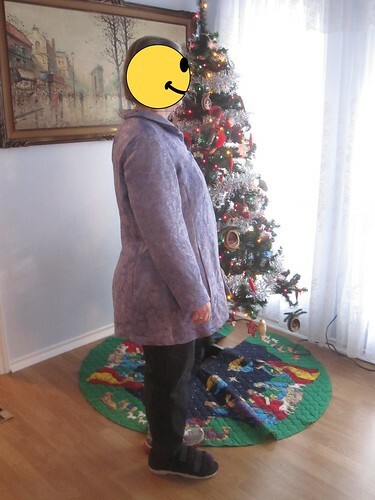 I wasn't crazy about the super dark purple as compared with the pastel purple of the jacket, but my mom said she liked it so I sewed it on and that was that. I forgot that I was really working hard to make sure this got done on time, and didn't take any in-progress photos. This is the only photo I have of the inside, showing my two different linings. I was in stashbusting mode and didn't want to buy a new lining. The body lining (the red-purple) is leftover from a skirt I made for her a couple years ago. I've made her several tops to coordinate with the skirt. I thought it would be nice to wear the jacket with the skirt and show off the matching lining. 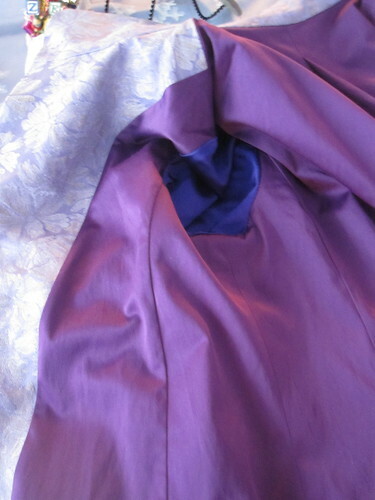 The blue-purple sleeve lining is the last of of the Fabric.com Vera Wang silk/rayon satin in that color. I've covered my mom's face for her privacy (that's Helen Mirren smiling in the front view photos). Here's a star whose face I *can* show, Crafty. 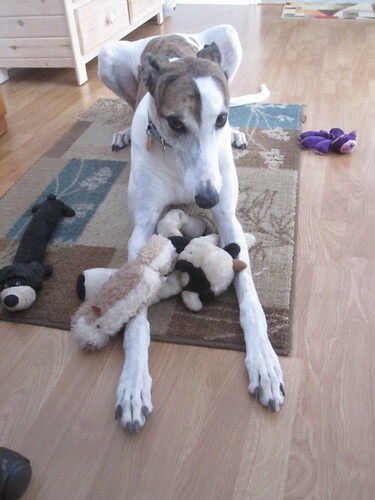 He is a retired racing greyhound and the nephew of my family's beloved Smash. We have always been a dog family, but this is the first time we have ever had a dog that likes toys. He loves them! Especially squeaky toys. He squeaks them for a while, then tosses them in the air for a while, the squeaks again. He knows his toys by name, so if you tell him to go get Pink Bear, he comes back with Pink Bear. It is adorable. He is wary of paparazzi, so any time I tried to sneak up on him to get an action shot he just looked at me reproachfully. 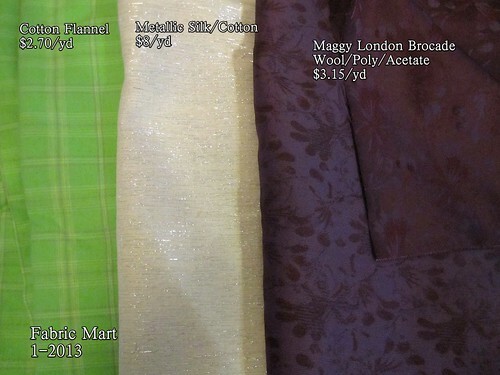 So, shortly after we made our pilgrimage to Fabric Mart, I placed an online order. The mustard ponte is the impetus for the order--I only bought one yard when we went to the brick and mortar store, and I realized that was just not enough. I want this for a dress, suitable coloring be damned. 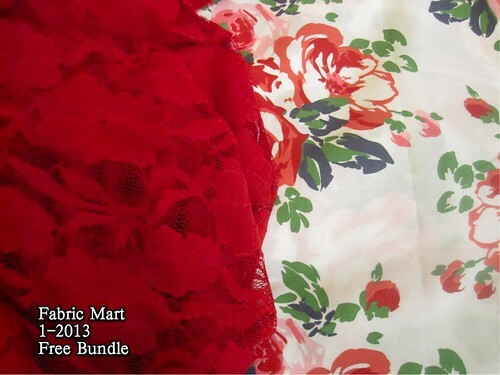 I had not made a Fabric Mart order since they transitioned to the new website (that is how good I had been! ), so I was able to use the "WELCOME" code for 20% off the first order. The prices reflect the discount. One of the fabrics I had permission to buy on our Fabric Mart excursion was for a trench coat. I didn't see anything while I was there, but when I saw this gold snakeskin-embossed coated linen on the website I couldn't resist. Don't ask my why I didn't turn it right side out for the photo, but you can see a little bit of the right side at the upper left of the photo. B&J has a coated linen snake print for $29.95. My $6/yd is one fifth that price. I think I got a deal. In snoop shopping ideas for a gold trench, I came across this Burberry Prorsum. It is from Spring 2006, so old news in the fashion world, but I don't think it has lost any of its allure in the intervening 6 years. Love! The silk/cotton, I realized when I received it, is what Karen made into her wedding dress! It is really lovely stuff. I am still contemplating patterns. 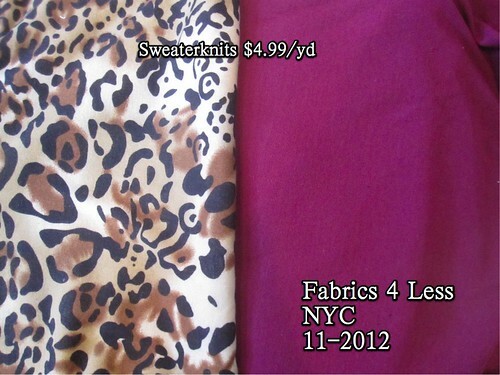 But at less than $4/yd for a silk/cotton? Please. No way I could leave it there. As for the pique, again, $1.60/yd? Please. I like red/white/blue prints for subtle 4th of July stunt dressing, and also just for every day of course. I was randomly looking through old posts the other day (a couple months after this order) searching for a specific inspiration piece and I stumbled across my Spring/Summer 2011 inspiration post. Well, look what I found! I had completely forgotten about this inspiration piece, but clearly I still love the fabric, lol. I don't know if you can tell from the snippet in the photo, but it is definitely the same fabric (though the red flowers bled a bit in the wash and my white bits are now faintly pink, boo). As I have the past several years, I went to NYC in early November to give a speech for work. What's a trip to NYC without a visit to the Garment District? That's a rhetorical question. I know you feel me. This lot is rather boring and virtuous, sweaterknits for simple long sleeve tops. 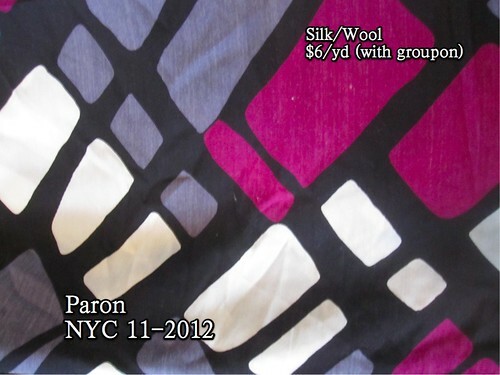 I got this wool/silk from Paron for a CRAZY steal. While I was in NYC I saw on Clio's blog that Paron had a Groupon. I immediately bought it and printed it out in the hotel's business center. For some unfathomable reason, this had made it into the 50% section (note: at the new Paron, the entire back section is *not* the annex--you have to check each individual fabric to see if it has the 50% off tag). The Groupon was $20 for $40, essentially a 50% discount. So I got this at 25% of its original price--$6/yd!!! This fabric was worth every penny of its original $24/yd price. Huge bargain. 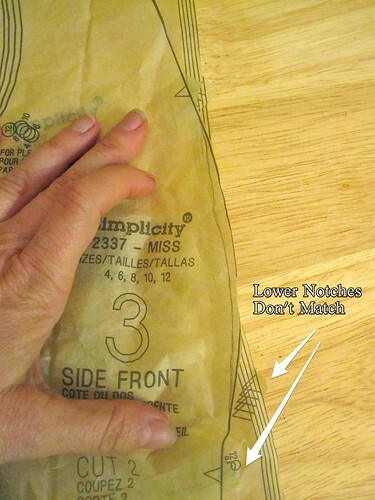 The fabric drapes well and isn't sturdy enough for a fitted piece. 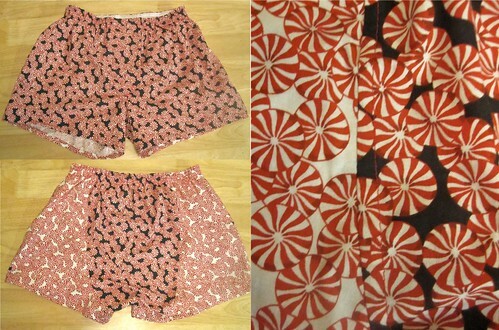 I saw someone make Simplicity 1796 on PR and knew it was perfect for this fabric. It doesn't look like much on the envelope, and I never would have chosen it from the catalog. I got the pattern at Joann during the most recent sale and can't wait to make it. I am required to inform you that Kashi is lonely and sad about not getting enough visits from bloggers/Pattern Reviewers. Duty discharged. The lace was just so cool that I couldn't resist. I really love the lace trend, but find it difficult to wear in the office. My tone-on-tone lace skirt is a staple (though not bikeable so I haven't worn it much lately), but floral lace seems hard to make professional. This square lace can totally work in the office, in my opinion. I was thinking I'd make another tone-on-tone skirt, but now I am in love with the idea of a shift dress with a gold lining. Which is more cocktail than office, thus defeating the purpose. And my life is waaaaaaay more work than cocktail. Le sigh. The silk dupioni is for another obi, as I wear the three I've made all.the.time. 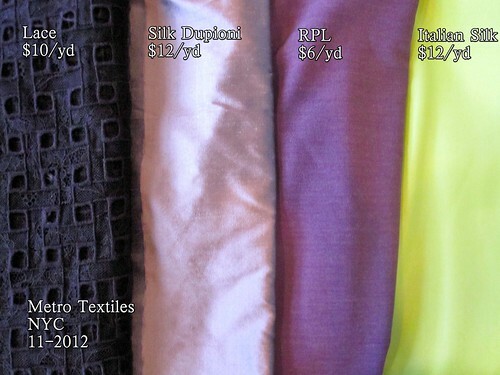 The RPL is for a dress--it is so hard to find stretch wovens!!!! I'm not sure I love the color, though. It was the only non-black/navy/gray color in the lot. We'll see. 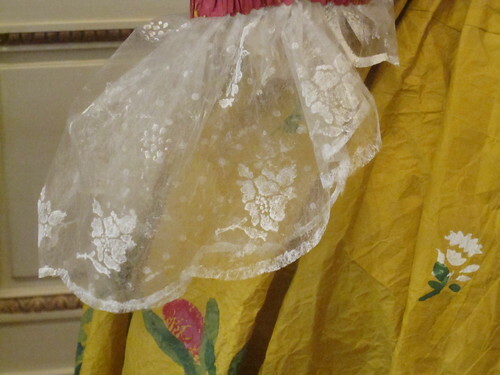 The lime-colored silk was an indulgence. I have never seen anything of that quality. The weave is something like habitoi, but fine with no slubs. It has body, but isn't crisp. The sheen is remarkable. I just had to have it. And as you know, I've already sewn up this printed denim from Chic! I also bought 10 yards of batiste. My last source, Vogue Fabrics, appears not to carry batiste anymore and I was dangerously low--down to my last 1/2 yard, I think. 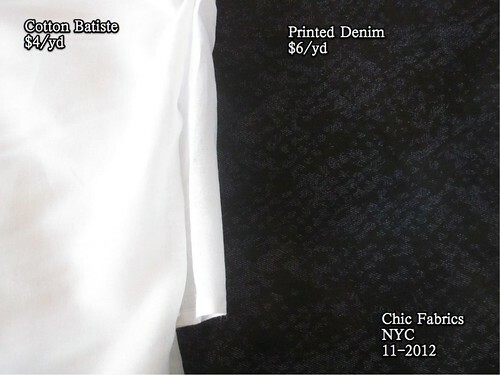 Chic's batiste is narrow, but the quality exceeds what I've bought from anywhere else--and it is not $4/yd anywhere else. Frankly, I think they (or at least the salespeople) have no idea what they have on their hands. The guy was kind of incredulous that I wanted that much of the fabric, and tried to sell me some shirting instead. 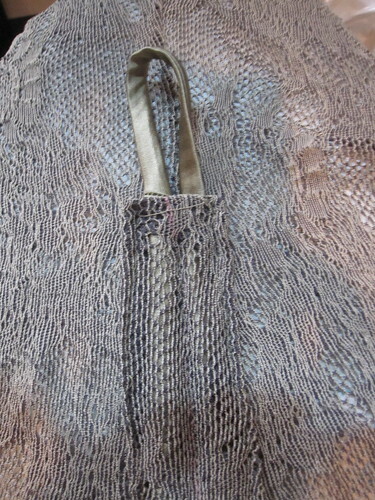 It is quite sheer, however, and may not add the needed opacity to some fabrics. This time I prewashed in the bathtub, which wasn't fun, but didn't get it all creased up like using the washing machine. I also ironed this SOB before rolling up it. Ironing 10 yards of batiste: not my idea of a swell Saturday night. I am woefully late in blogging this meetup, but it has been well-blogged, especially by Robin, our hostess (seriously, visit the post, if only to see how fab I look in the group photo. I have no idea how that happened. I am *never* the one who looks good in a group photo.) 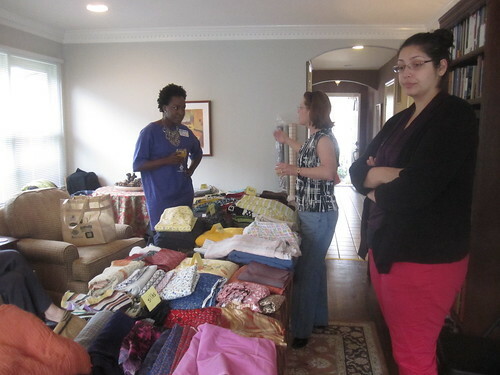 Suffice it to say, we all brought truckloads of fabric and patterns to swap! In my defense on this one, I bought a Groupon to G Street several months ago and had to use it before it expired. 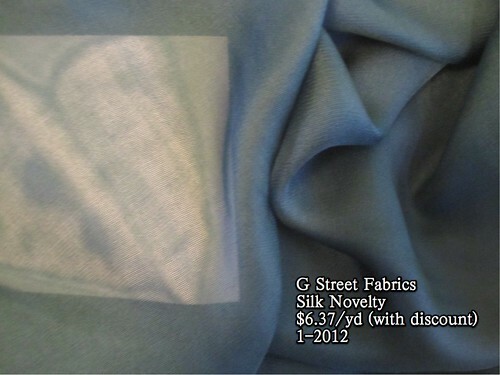 I bought several notions, and this gorgeous teal silk. I normally am firm about resisting silk sheers. I don't see the point of sheer fabric--it's not really "clothes" if you have to wear it with something else! But this is my color, and the weave is really nice. It's not a chiffon or an organza--the texture is somewhere in between. It will be another Burda 02-2009-123 shawl collar wrap blouse. And will you look at that? The knit I got at the meetup (second from the right) will be excellent for a camisole underneath. See, it all comes together. The excuse for this purchase from Fabric Mart was the cotton flannel for interlining a coat (which, err, is still in the flat fold stage). It was 50% off, and PRers had described the quality as excellent. I wasn't going to get that price, width, *or* quality from Joann, so I decided it was time to get it. I haven't been able to get Cidell's gold shorts out of my mind so I ordered the metallic linen. It's not quite what I expected--instead of a subtle sparkle it has visible silver lurex threads running through it. 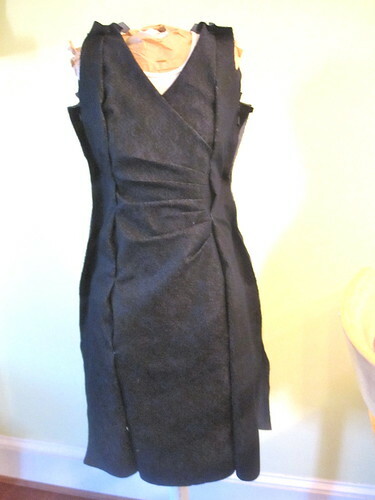 I was drawn to this Maggy London wool blend for a Fall/Winter dress. After I placed my order, I realized the fabric was perfect for this Oscar de la Renta dress ($1890) that was one of my top picks last year. I have been looking for a suitable fabric since then, believe it or not. It needed to be something with body, but not a lot of bulk with all the pleats. I really wish I'd bought another half yard. 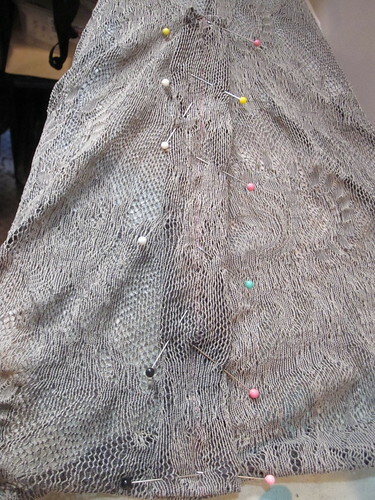 Hopefully I can squeeze it out, which may entail narrowing the skirt. 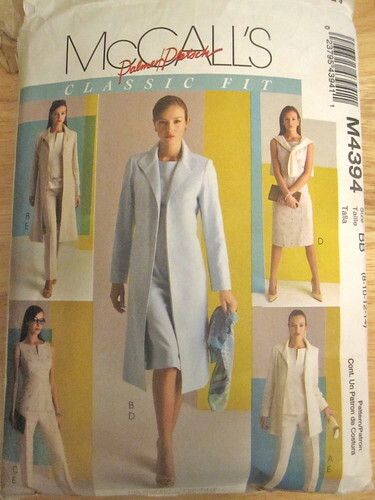 Butterick 5558 (now out of print, unfortunately)--a Maggy London design, by coincidence--is a great pattern match. 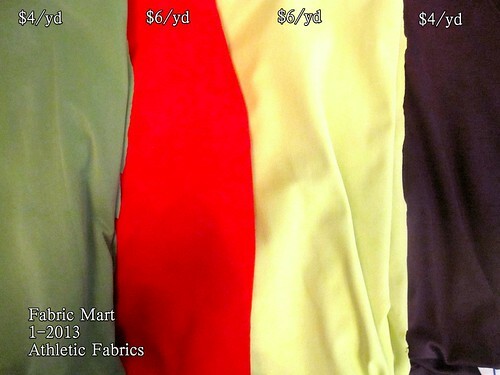 Athletic fabrics for t shirts. These are *excellent* quality--thick with great recovery. 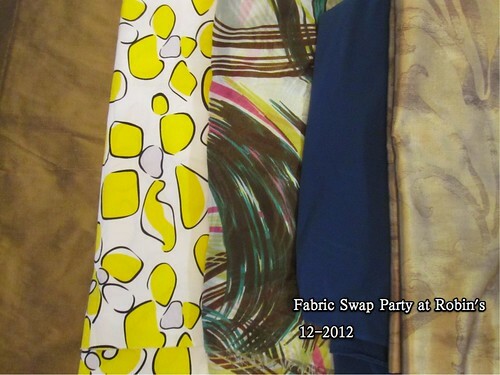 Unfortunately, I was unhappily surprised by the colors of the two $6 fabrics. The red is a very orangey red, not the blue-red it appeared on my monitor and that flatters me, and the "honeydew" is very, very pale and doesn't suit me. I am debating sending them and the metallic linen back. Does anyone have experience doing returns to FM? Is it bad form to consider a return if there's nothing wrong with the fabric, I just don't like it? FM is a great company and I don't want to take advantage of them. My free bundle. A friend just started taking sewing lessons and mentioned wanting easy-sew cottons to practice on so I will give her the cotton print. I was not at all turned on by the red stretch lace--floral, you know--until I realized it would actually make a cute nightie (backed by an opaque knit!). OMG. I know. Out of control. I have been sewing diligently, I promise. Alas, no amount of diligence can offset this damage in under a year. Gulp. 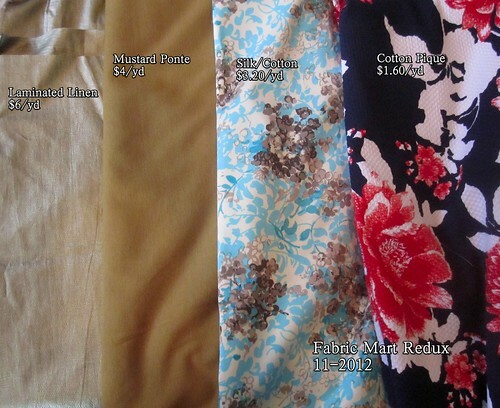 I need to come up with a workable plan for fabric-buying this year. Maybe every other month? This look is fairly popular in RTW, and I've made a couple of pieces with these side pleats, notably my red Simplicity 2053 (and Butterick 5672 in a knit). However, in past projects the pleats have not quite worked, being too poofy over the stomach and emphasizing rather than disguising it. 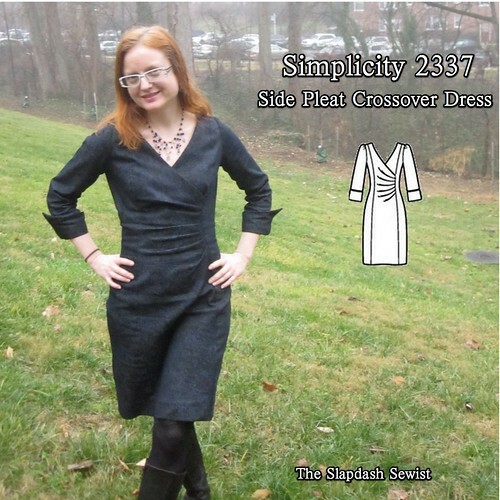 Simplicity 2337's pleats are contained by the princess seams, so they do not radiate over the entire front of the dress. It turns out that is the key to wearing this style for me. When they are the entire width of the front there is too much room for them to open up over the belly. Over a narrower area, they are contained and stay put. I wasn't sure if the denim would end up looking dated, but this collection of denim dresses convinced me otherwise. There is a printing error on the pattern. What appears to be the lower bust-matching notch on the side front is actually the position of the small dot, which indicates where the crossover front edge is matched. The lower bust-matching notch is just missing. However, I didn't have any trouble getting the bust right (which is partly due to my small bust adjustment--you can see the pencil marking where I shaved off some width). 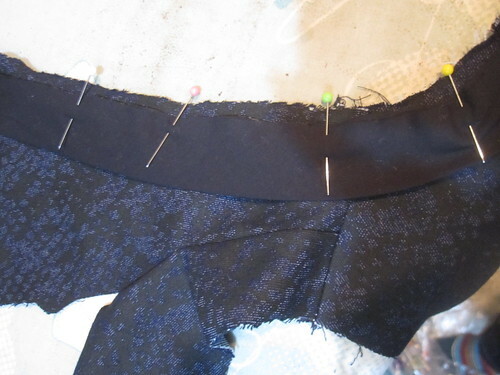 I used tailor's tacks to mark the joining point for the crossover at the front princess seams. The matchup was easier than I expected it to be and didn't require any fussing or adjustments. I normally fit as I go, but this dress was tricky. The neckline has to be finished before the front princess seams can be sewn, because the finished neckline is caught into the seam. 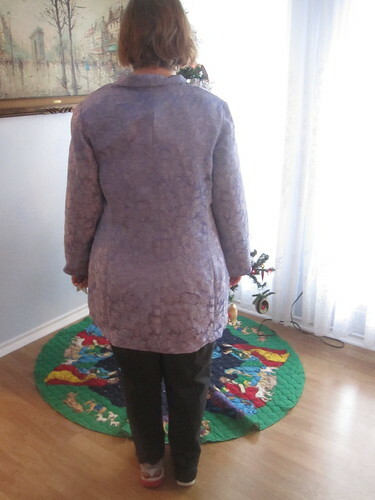 I pinned it together and I determined that other than a gaping back neckline, the fit was close enough that any final adjustments could be made at the side seams. I ended up taking it in quite a bit at the waist and a little at the hips, but in the end the fit is really great. Before cutting, I did the small bust adjustment by shaving off some curve on the side front bust and shortening the front crossover by about 3/4 of an inch. I did a broad back adjustment and, as mentioned, I added neck darts to deal with the gapey back neck. 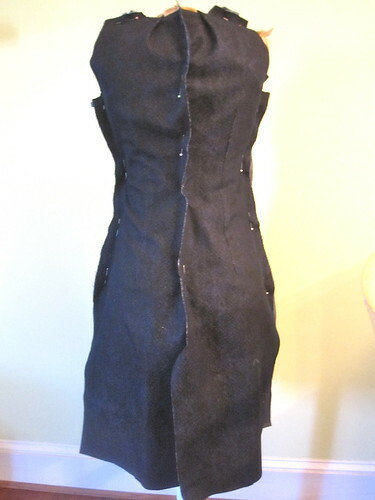 Because I was sewing with a fairly beefy denim (purchased in NYC when I went there in November--I have a lot of confessing to do), I used bias tape finish to the neckline rather than a facing, which would have been very bulky. 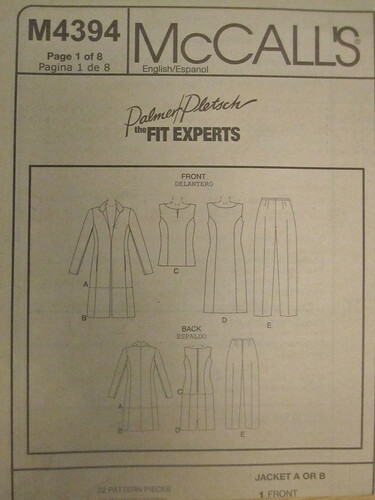 This pattern's one downside is that it would be very difficult to line in the front crossover version, The front neckline must be finished before the princess seams are sewn, and the finished neckline is sewn into the seam. Therefore, the lining would have to be caught up in the front princess seam, at least for some distance. So you have a lining that is either not free floating and could distort your fashion fabric in wearing, or a very ugly inside. I think the best solution would be an underlining. I have been really dissatisfied with the tops of my invisible zippers lately. I cannot get a nice straight-across look for the life of me. Since the neckline here is large enough to pull over my head, I installed the zipper a few inches below the neckline, closed the neckline up above the zipper, and then finished it with the bias tape. 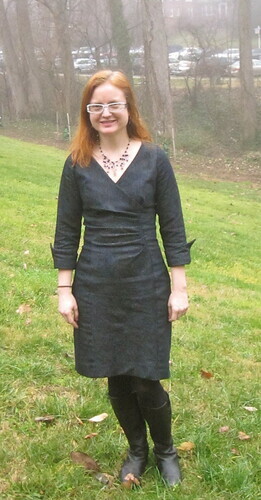 Apparently, this has been a chronic problem because I wore my double-faced wool Burda 10-2011-123 wrap dress the other day and realized I'd done that zipper/neckline the same way, presumably for the same reason. I really need to give up on backs without a waist seam. 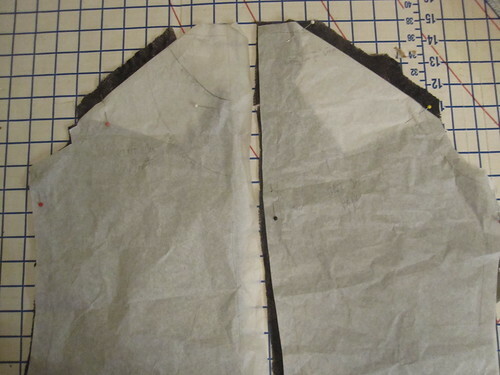 A waist seam will be less noticeable than wrinkling, I think, even if it seems somewhat weird. This is with a very generous swayback adjustment, btw. The pleats are not quite in the place I need them; it would be great if they were moved down by one. I'm not sure if I will undertake that or not. Or perhaps the fact that the pleats aren't over the tummy is why this looks good? This was supposed to be a closeup of the cuff, which I took from vintage Simplicity 6110. You can sort of see it. We were having an unusual fog when these photos were taken. DC's reputation is that we are living on a swamp, but we really don't get fog that often, and certainly not all day fog. So the lighting is weird and I feel emphasizes the wrinkling of the denim. I know it sounds like a cop-out to say the dress looks better in person than in photos, but trust me, this dress is DYNAMITE in person. When I finished my first thought was, "OMG, I can't wait to make another one of these!" Perhaps my splurge Julie's Pick fuschia wool fabric from Fabric Mart? I found this stretch lace on the $2.97/yd table at G Street Fabrics a while back and had been puzzling over what to make it into. With lace being in style right now I wanted to make it up fairly quickly, but the somewhat blah color and the fact that it would either have to be lined or worn with a camisole was cramping my creativity. Enter Burda 09-2012-123 with its contrast shoulder and the fact that I had this silk charmeuse in an exactly matching color and voila! 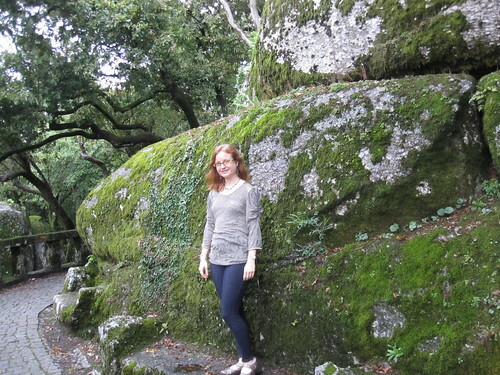 Perfect long top to go with my jeggings. I got this made in my pre-vacation sewing. The photos were taken on Mt. Penha in Guimaraes, Portugal. The contrast shoulder is a nice way to dress up a plain tee, as in this Classiques Entier® 'Pezza' Leather Trim Ponte Top, $168. I used the Burda pattern as a guide to mark the contrast shoulder on my TNT tee pattern. 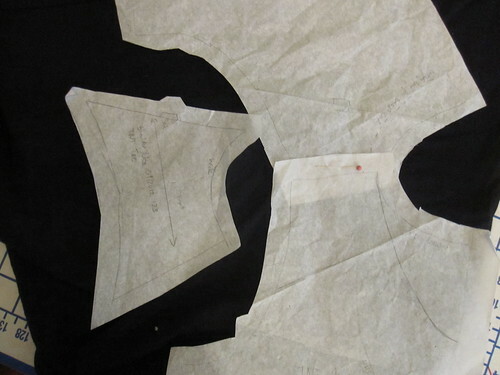 I pinned the front and back pattern together along the stitching line at the shoulder, and then drafted the shoulder inset as a single piece. To cut the body of the tee shirt, I just folded down at my marking and added seam allowance. I wanted to make the tee long to be worn with the jeggings, but I liked the idea of an adjustable length with ruched sides, rather than just gathering the side seam and permanently fixing the length. I cut a rectangle of fabric the length I wanted, and 2 1/2 inches wide. 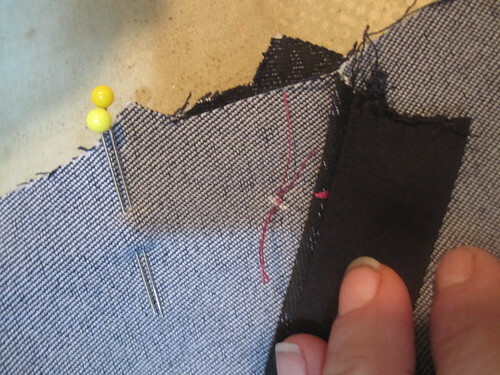 I marked down the center of the fabric, as this line would be stitched for a channel. I started by sewing the marked center channel line down, starting from about 1 inch from the top and folding under the seam allowance at the bottom. 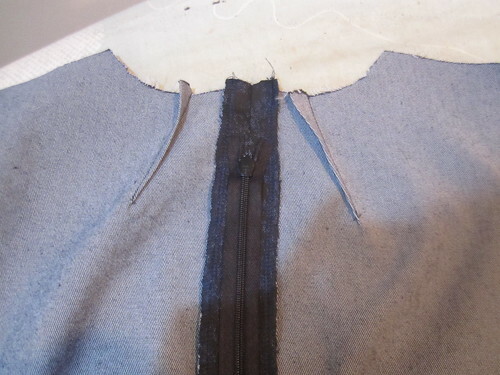 Then I turned under the seam allowances on the top and the long sides and stitched down the long sides. Be sure to leave the top open at this point so you can put in your drawstring! Once the drawstring is in, stitch along the top, being careful not to catch the drawstring. The Burda is drafted with a keyhole neckline and tie in the back. Since my TNT pattern has a center back seam anyway, I decided to keep that detail. 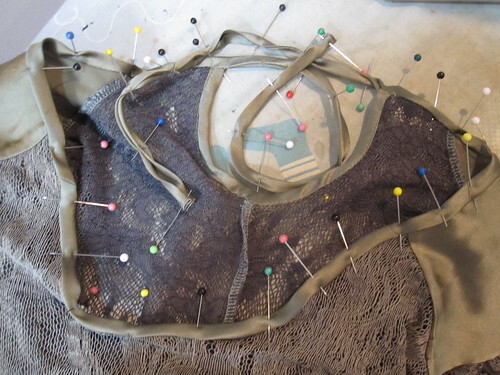 I started by finishing the keyhole, then moving on to the neckline. I made bias tape from my contrast silk charmeuse and first sewed it to the inside of the neckline, right side of the bias tape against wrong side of the fabric. The bias tape extended at the end to form the tie. Then I folded the bias tape over to the right side, pinned, and stitched. I did a *ton* of pressing on the neckline and it still doesn't sit quite right. Maybe I didn't cut my strip exactly on the bias? Regardless, it's something that I think only I will notice. The back keyhole is a nice little touch, and helps bring the contrast silk more into the tee. To add a little more interest to this top, I used the sleeve from Butterick 5562, the short sleeve from View A, which is much nicer than the similar but not identical long sleeve from View B. This was a fun use of my stretch lace, and I thought it made a nice travel piece. It is cute and trendy, and--most important--doesn't look like work clothes! If I find the right combination of fabrics I can definitely see making another of these contrast shoulder tees, though probably without the keyhole and the fancy sleeve.